These two locations are so close they’re more or less within sight of one another. Consequently, we might as well look at both of them at the same time. 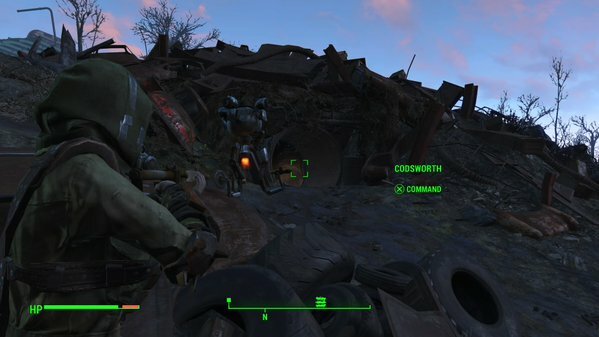 You can find them by heading south from Tenpines Bluff and following the busted-up freeway. Bedford Station is along the train tracks, while Rotten Landfill is down the hill to the southeast. Bedford Station will occasionally pop up as part of a Cleansing the Commonwealth quest from Knight Rhys, so you may discover it that way as well. - True to its name, Rotten Landfill is a giant heap of junk. Yay! It’s hard to miss, especially since someone will probably be shooting at Mole Rats upon approach. Help them out. You’ll find more of the things infesting the inside of the Landfill, and though they often get the drop on you, they’re pretty easy to kill. - One last thing, while you’re in the area. To the southeast of the Landfill is a small lake. It goes against Fallout wisdom, but if you dip into the lake from the northwest side (where you’re facing, basically) you can find a suit of Power Armor waiting. It’s crapped out in most respects, but it does have a Fusion Core installed, so hopping in and steering it out is an easy option. Enjoy!